Drinking Water Before Bed: Is it Good or Bad? Water! What would we ever do without it? There are so many uses and benefits of water that we cannot even begin to list them all. But what about drinking water before bed? Should you be drinking water before you go to bed every night, or not? Some experts say yes. You should drink water before going to bed because it is very beneficial to your overall health. Many people may suggest otherwise due to concerns about quality of sleep and having to get up from bed to urinate. This could be an even bigger problem for those who have difficulty going back to sleep after waking up. Our bodies are different and they function differently, but it’s believed that consuming a glass of water before bed can help your body retain and utilize all the important healthy properties you’d get from drinking water during the day. Which Is Better, Drinking Warm Water or Cold Water? Eastern medicine practices like Indian Ayurveda and traditional Chinese medicine advise against drinking cold water because of their belief that it causes contraction of the muscles, specifically those in the stomach. In the case of warm water, drinking it promotes healthy blood circulation and digestion while speeding up the elimination of toxins from the body. This is the reason why most health professionals tell you that you should drink warm water for your continued good health. The exception is that you can drink cold water during workouts or other strenuous activity on a scorching day, as it helps cool down your body temperature quickly. When should you stop drinking water before bed? Ideally, you should not drink water too close to bedtime as it may disturb your sleep cycle and, in turn, adversely affect your heart health. You should drink at least eight glasses of water throughout the day to prevent dehydration but not drink at least two hours before sleeping at night. According to a 2014 study published in PLOS One, a lack of water can lower your mood, leading to disturbances in your overall sleep-wake cycle. In this study, 22 high-volume and 30 low-volume water drinkers were examined. The people who regularly drank a lot of water weren’t as calm and content, and didn’t have as many positive emotions as they usually would have had as they couldn’t drink their regular intake. Conversely, people with a regular low fluid intake felt more positive emotions, contentedness, and calmness than they usually did when their water intake was increased. Cardiologists say that drinking a glass of water before bed helps in reducing the risk of heart attack or stroke. According to a 2002 study published in the American Journal of Medical Epidemiology, people who drank at least five glasses of plain water a day had a much lower chance of suffering from fatal coronary heart disease when compared to people who drank less than two glasses a day. Drinking water before bed particularly improves blood circulation in the body at the time when you have the highest risk of a heart attack. Drinking warm or hot water is thought to detox the body and help in digestion. It aids blood circulation, promotes sweat production, and helps in ridding your body of metabolic waste. Sweating removes excess sodium from your system and cleanses the cells of your skin. Adding lemon to your water to drink before retiring to bed gives you a boost of vitamin C, which helps stimulate your immune system as it fights infection. 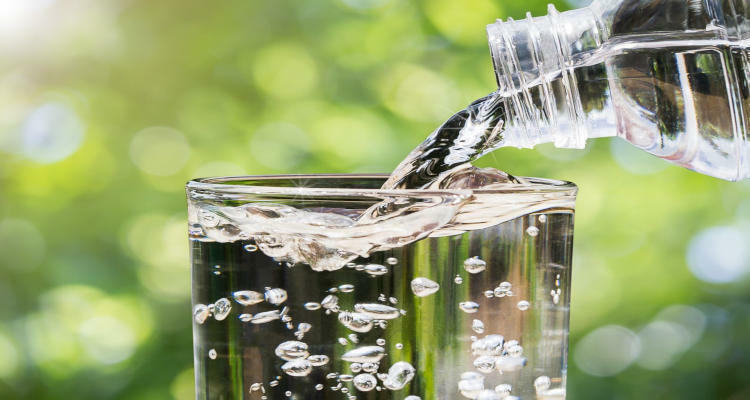 Having insufficient water in your body leads to constipation, irregular urinating, dry mouth, headache, and vertigo, and could create a fatal situation. Your body will stay hydrated if you drink a glass of water before bed, but avoid drinking it too close to your regular sleep time. Since you don’t need much water when you are sleeping, a glass of water is sufficient. When you drink alcohol, you feel the need to urinate frequently, which could lead to dehydration. This causes some of the symptoms of a hangover. To avoid a hangover, you should have a glass of water between alcoholic beverages and a glass of water before you go to sleep. Finally, according to some, drinking a cold glass of water before bed might help you sleep more fitfully so that your body can stabilize its hormone and nutrient levels. Your joints and muscles are also said to become more balanced, and your body can restore itself more naturally. The cold water reportedly allows your body to relax instead of pushing itself harder to replenish you with necessary nutrients. There is little scientific evidence to support these claims, however. Does Drinking Water before Bed Burn Calories? Drinking cold water can increase the number of calories burnt in your body because it acts as a metabolism booster. The body will require more energy to heat your system, so drinking cold water before bed helps the body burn additional calories—though not a huge amount—as you sleep. But hey, every little bit helps! When Is It Bad to Drink Water Just before Bed? Drinking a lot of water before bed may cause some people to get up frequently in the night to urinate. This would disrupt sleep, which, over time, can cause health issues like weight gain. Those who suffer from sleep problems should not drink water before going to bed or should drink it at least a few hours before they tumble into their beds. This way they can empty their bladder before bedtime and get a good night’s sleep. As drinking water before bed can increase the number of times you get up to urinate at night, it’s important to note that insufficient sleep can affect your heart health by influencing your potential for developing high blood pressure, high cholesterol levels, and lead to weight gain. According to a study conducted by the National Sleep Foundation, adults aged 45 and over who slept for fewer than six hours at night were more susceptible to a heart attack or stroke than others. According to a 2007 study published in the Journal of Cancer, people who drank large amounts of water closer to bedtime had a greater chance of suffering from bladder cancer. On the other hand, people who drank a moderate amount of water an hour or more before bed had a lower risk of suffering from bladder cancer. This is because a moderate water intake may reduce the exposure to potential carcinogens by diluting the urine and decreasing the contact time with the bladder lining by increasing urination frequency. However, a high water intake may increase the net flow of cancer-causing toxins into the bladder and eventually increase the risk of cancer. Put simply, drinking too much water right before going to bed could lead harmful chemicals to stay in the bladder for a longer period of time and extend the bladder wall, which may up your cancer risk. More research is needed to confirm these study results. According to health professionals, it is very important to have a glass of water before bed every night. While cold water can be taken, it is generally better to have warm or hot water because it has several benefits to offer, like improving your blood circulation and helping remove toxins from your body at a faster pace. Drinking water before bed may provide several potential health benefits, such as improving your sleep, brightening up your mood, improving your heart health, acting as a natural body cleanser, keeping your body hydrated, and helping you avoid a hangover. But care should be taken that you do not drink excess water just before going to bed, because it could prove to be harmful to you in multiple ways. Drinking water just before bed could lead to increased and frequent urination, disturbance in the sleep cycle, increased risk of heart attack or stroke, and a higher risk of suffering from bladder cancer. For these reasons, water should be drunk in moderation and at least a few hours before bedtime so that you can urinate and go to bed with an empty bladder. Drinking cold water can also slightly increase the number of calories burnt by your body as it will work harder to warm the system. This could be helpful for people following a strict daily caloric intake. Water is essential to our lives and drinking a glass before bedtime is one possible way to keep the doctor away and lead a full and healthy life. https://www.healtholino.com/4-health-benefits-of-drinking-water-before-bed/, last accessed November 15, 2018.
https://www.aquazania.co.za/2017/07/hot-vs-cold-benefits-of-drinking-hot-water-vs-cold-water/, last accessed November 15, 2018.
https://www.healthline.com/health/drinking-water-before-bed, last accessed November 15, 2018.
https://www.watercoolersdirect.com/blog/drinking-water-before-bedtime/, last accessed November 15, 2018. “Effects of Changes in Water Intake on Mood of High and Low Drinkers,” PLOS ONE, April 11, 2014; https://www.ncbi.nlm.nih.gov/pmc/articles/PMC3984246/, last accessed November 15, 2018.
https://academic.oup.com/aje/article/155/9/827/58224, last accessed November 15, 2018. Gill, S., “When is the best time to drink water?” MedicalNewsToday, March 18, 2018; https://www.medicalnewstoday.com/articles/321250.php, last accessed November 15, 2018.
https://healthyeating.sfgate.com/drinking-water-before-bed-lose-weight-12221.html, last accessed November 15, 2018.
https://www.sleepfoundation.org/sleep-news/how-sleep-deprivation-affects-your-heart, last accessed November 15, 2018. “Fluid intake-to-bed time, nocturia frequency and the risk of urothelial carcinoma of the bladder: a case-control study,” Journal of Cancer, September 15, 2017; https://www.ncbi.nlm.nih.gov/pmc/articles/PMC5665043/, last accessed November 15, 2018. Watson, K., “What are the risks and benefits of drinking cold water?” Healthline, January 8, 2018; https://www.healthline.com/health/is-drinking-cold-water-bad-for-you, last accessed November 28, 2018.